Ipe hardwood decking is a hotsale outdoor deck flooring material across the world with its outstanding weathering resistance & durability.In china, Ipe is more widely used for indoor solid wood parquet flooring than outdoor decking due to the long raw wood board material shortage.450-1200x120x18mm solid T&G ipe flooring is more commonly seen in the market of China.Very few wood decking companies in China supplying ipe exterior use decking in length of 1200mm or above due to the high cost and raw material shortage. 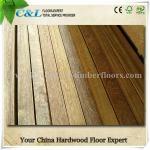 C&L hardwood is a wood decking supplier China who source ipe decking raw material directly from South American countries like Peru,Brazil and mill the outdoor Ipe decking to custom made sizes in China factory. Ipe wood moisture control: 12%-15% or custmon made to client's required humidity to prevent the excessive expanding and contracting of the timber in outdoor use. Installation Site: Balcony,Swimming pool side,Courtyard,Porch areas etc.